Supplied as a ready-to-use 2X master mix, qMax Green has been engineered for high sensitivity, fast cycling and excellent reproducibility. Superior sensitivity and fast cycling with exceptional results. Ideal for low copy number templates. Ready to use 2x mastermix. Use our PCR Selector tool for help in choosing the right Accuris PCR Reagents for your applications. Supplied as a ready-to-use 2X master mix, qMax Green has been engineered for high sensitivity, fact cycling and excellent reproducibility. 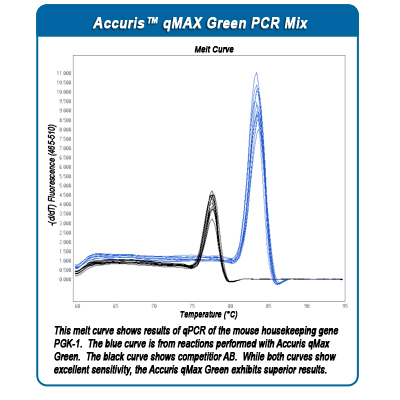 Accuris Hot Start Polymerase provides accurate PCR of a variety of templates including low copy number and difficult sequences, while the proprietary qMax Green intercalating dye exhibits higher fluorescence and lower PCR inhibition than other popular green dyes. To check compatibility with a specific instrument, please use our PCR Reagent Selector Guide.